It seems that industrial elements in home furnishings is a design trend that is becoming more and more popular. I think this is due is large part to the Green movement and the emphasis that consumers and especially those in the design community are placing on recycled and/or sustainable design. Whatever the reason may be, I enjoy a little industrial design every now and then. It can be an unexpected element to a traditional room, or add to the texture and interest of a more contemporary space. While I use to only find industrial type furnishings in specialty warehouse shops in New York or LA, this is no longer the case. The trend has caught on and well-known home furnishing stores and catalogs have caught the industrial fever. Cleveland Art - Located in Los Angeles, you can view their inventory online. 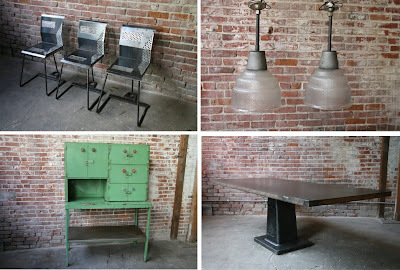 Most items are vintage industrial pieces "repurposed and recycled for functional design for the home". Below are some cool examples of items available at Cleveland Art. 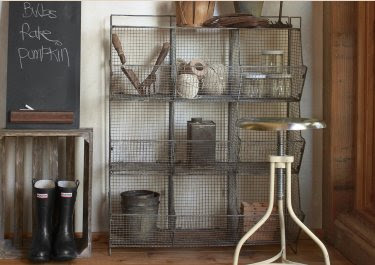 Bobo Intriguing Objects - Located in Atlanta, rustic meets industrial. Below is their Pharmacy Rack, Alexandre Table, and Step Side Table. 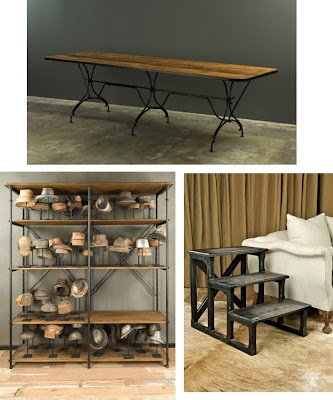 Noir - I believe Noir is only available through a designer or design showroom, but they have great industrial pieces, all reasonably priced. Below is a fun little cart that would be great as a side table and a pedestal table with a steel base. 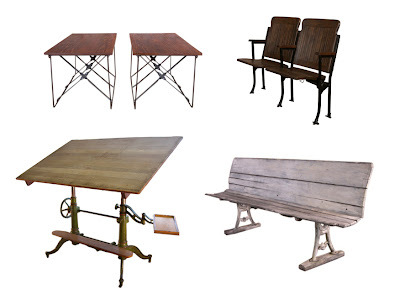 Get Back Inc. - Located in New York, they transform their vintage finds into functional furniture. Really one-of-a-kind items, you name it they have it - all kinds of lighting, shelving, and interesting seating like the theater seats shown below. When I move into a roomier office, I'm seriously going to consider purchasing that drafting table. The Sundance catalog - I love mail order! Cute stuff, good prices. 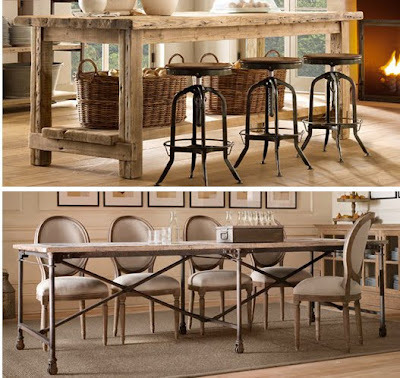 Restoration Hardware - Their industrial items are a new addition to the store. Below is their Flat Iron Table and Vintage Chairs. Anthropologie - Here are some of my favorite pieces Anthropologie has for sale, but visit their website to view more industrial items. thank you so much for this post! I have been trying to pull together a room that fits this style exactly. and this information has been so helpful in my search! Hi!! This is the first time that I see your blog! !